The final shofar blast of Rosh Hashana. The person playing the shofar takes a deep breath and starts to sound the tkia gedola, the great tkia. Stretching his lungs and the length of the shofar blast to the limit, the sound grows louder and louder. Ten seconds pass. Then twenty. Then thirty. The shofar gets louder and louder. A full minute passes. The sound of the shofar is almost deafening. After two full minutes, everyone in the shul realizes that the person playing the shofar is no longer playing the shofar. The Shofar is playing him. Louder and louder and louder. The shul starts to vibrate. The dust of ages falls on the bima from the chandelier swaying above. The shofar is now playing the shul. The sound has spread outside and cars start to vibrate. The sidewalk starts to vibrate. The houses, the trees, the earth, the sky everything is vibrating in sympathy. Everything is sounding this one long tkia gedola. Everything in creation is sounding Hashem Echad. G-d is One. The Rambam (Maimonides) writes that one should not speculate about the coming of the Mashiach, for no-one knows exactly how it will be - until it will be. But if one is allowed a little daydream, this is mine. Drive down almost any road. Youll see that the line in the center of the road is sometime broken and sometimes solid. The tkia is like the straight line. It goes on and on. 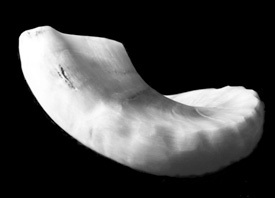 If there were air enough in the lungs of the person playing the shofar, it would never end. The tkia is Gods chessed, His Kindness. Just as He is without end, so His mercy is without end. Chessed is the straight line that runs for ever. The terua and the shevarim (literally broken ones) are the broken lines in the road of history. They are episodic, non-continuous. The terua and the shevarim signify din (strict judgment). Like din they do not go on forever. Hashem does not judge us with unremitting din. Even the most difficult times in Jewish history pass. The terua and the shevarim start and stop. A time of din can last a certain period of time but it then must come to an end. The word din is connected to the word dai, which means enough. In the service of the Beit Hamikdash (the Holy Temple), the Kohanim brought the korbanot (sacrifices) and the Levim played music. The Kohen represents chessed. By bringing korbanot, he activated the channels of chessed from Above. Chessed is the line that goes on forever. The Kohen is the tkia. The Levi represents Din - strict judgment. Every korban was accompanied by music. The Levi was the musician. He represents the broken line, the line of din. The Levi is the terua and the shevarim. What is the connection between music and din? All music is based on time. A note that has no end cannot be called music. The basis of all music is time even more than pitch. The essence of music is a note that starts and stops. The drum is a musical instrument (unless you happen to live next door to someone whos teenage son practices at all times of the day and the night! ), and the drum has a very limited connection to pitch. Music is based on starts and stops. Din is episodic. When a note does not stop but just goes on and on, its not called music. Its a tone. Its a siren. But its not music. A note with no end has no emotional identity. It is a sound with no human correlative, no point of access or reference. It is incomprehensible to us. It is music from beyond. A fundamental philosophical problem runs as follows: Seeing as G-d is Omnipresent, how can anything apart from Him exist? If He is everywhere, there can be no room for anything else. In which case, how can there be a world? G‑ds Omnipresence leaves no room for the world. This is the connection between din and music: Without tzimtzum there can be no world. Without limitation, without stops and starts, there can be no music. Without tzimtzum, without din, all that exists is the constant note of the tkia that goes on forever. It is not music. It is a sound as unintelligible to the mind of man as He Who spoke and the world came into existence. It is the music from beyond.